So the Smarter Balance results are out and everyone is certain all the news is bad. The LA Times called the results sobering, while the Chronicle said they “weren’t stellar”. But in fact, California’s juniors did a good job. They qualified as “college ready” or “a year from college ready” at the same or higher rate than prior years. We can’t do a pure comparison at this time in math, but I’m hoping that California will make the necessary data available. However, even in a broad comparison, junior math scores improved over 2014 and was on par with 2014. As for English, far more juniors are going to finish high school qualified for credit-bearing college courses than ever before. 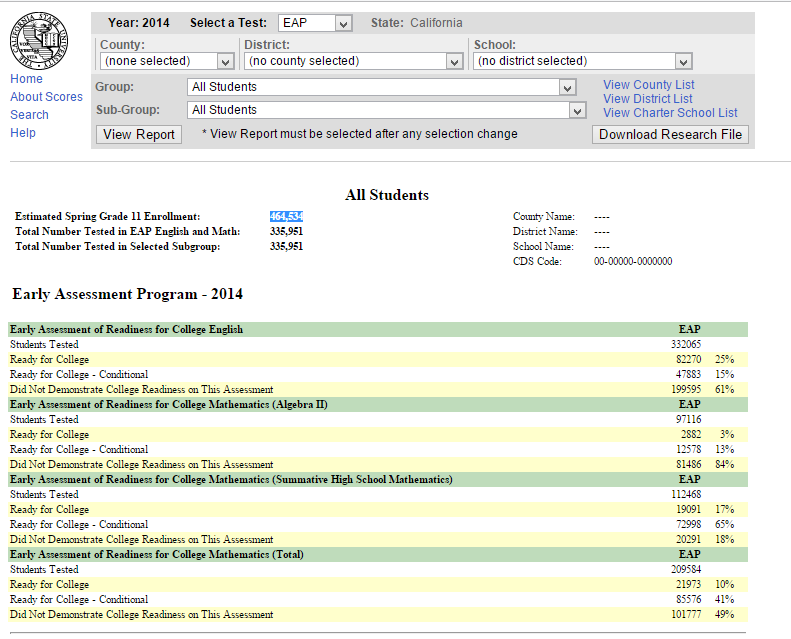 California’s Early Assessment program (EAP) provides juniors with an assessment of their college readiness in math and English. Students are categorized as either Proficient (fully ready for college work) or Conditional (must get a C or higher in a qualifying course their senior year). While the state is admirably thorough in providing results data, reporters tend to boil all this complexity down to a single factoid–the percentage of students deemed ready for college math. And even this, they usually get….well, not so much wrong, but the information is portrayed in a misleading fashion. Before last spring, the EAP assessments were not a single test. In English, juniors had to agree to sit for an essay test a few weeks before the California Standards Tests (CST). Then, during the CST, interested juniors took an augmentation packet of questions in additional to the standard test. ELA participation was relatively high, but rarely 100%. The math EAP was more complicated, but at least took place in one sitting. Juniors taking Algebra 2 or higher took their usual CST end-of-year test as well as another augmentation packet. Unlike the ELA, math students taking the EAP did not all take the same CST test. Students in Algebra 2 took the Algebra 2 CST; students who had finished algebra 2 took the Summative CST. Both groups were then evaluated with select questions from these different tests and the total augmentation packet. Juniors who hadn’t yet reached algebra 2 could not be assessed for college readiness in the CST years. A few years back I had some excellent geometry students who might have been able to test at conditional status if given the opportunity. 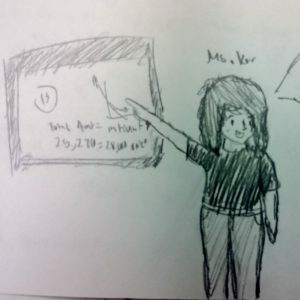 I emailed a query and learned that simply taking the additional packet was not enough; the students had to take either the Algebra 2 or Summative test. 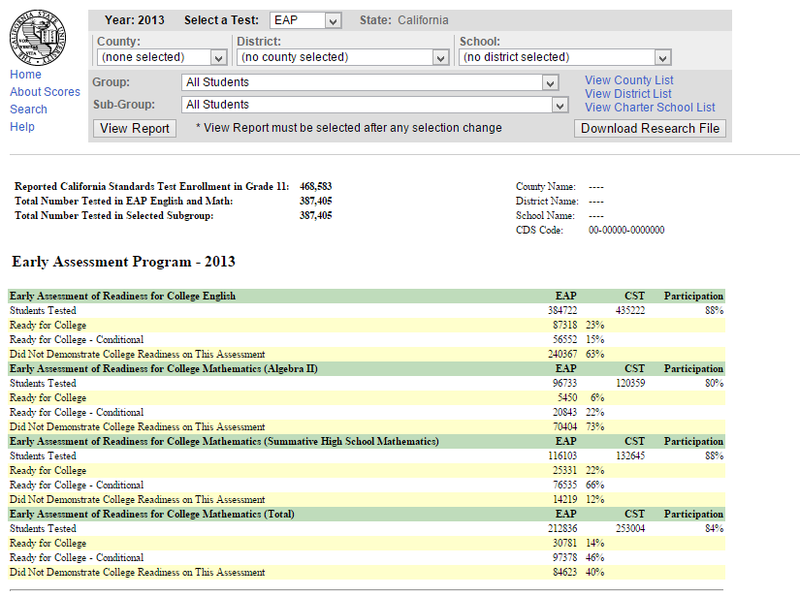 The EAP state results only provided passing percentages based on EAP testers. So it’s easy to look at the 2014 results, see that 49% of all testers “did not demonstrate readiness” in math, and wrongly conclude that 51% of all juniors did demonstrate readiness. The numbers to make the right conclusion are on the page, but easy for the novice to miss. Since 2015, all juniors take the Smarter Balanced test, regardless of their math entry point, and so all juniors are assessed for college readiness. This affects the ELA numbers somewhat, and the math results dramatically, since in prior years around a third of all students weren’t allowed to take the test. So how’d they do? The cleanest year to compare to is 2013, the last year we had both the CSTs and the old-style EAP. The next year, 2014, juniors took the CST purely for EAP purposes, but the state wasn’t as careful with the statistics, and it’s a bit hard to determine how many juniors didn’t take the EAP that could have. Here are 2013-15 results–the important numbers are in the last two columns, which show what percentage tested as proficient or “conditional” (a year away from proficient). Unless I’ve made a boneheaded mistake, these numbers do not jibe with the reporting of the results. California’s juniors should be singled out as a substantial exception to the overall story of lower scores. They did far better on the ELA and held their ground in math, improving over the most recent year. Is the test significantly easier? The best way to determine this requires information about the pass rates per course. How many algebra 2 students passed? How many geometry and algebra 1 students passed, if any? I’m hoping that the new results in October will include student passing rates by subject. Should more than 30% of students be ready for math at an advanced level? That’s a question for another day. For now, let’s take note that California’s juniors did just fine and even improved on prior performance with a difficult new test in a new medium. Let’s take a moment to celebrate their achievement.